Today is an important one here at the March of Dimes. 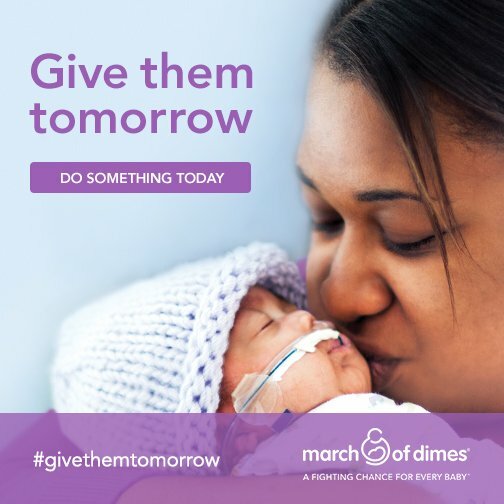 Today we launch our new campaign, Give them tomorrow, to raise awareness and funds to fight birth defects and premature birth, the #1 killer of babies in the United States. sending a message of hope to a family of a baby in the NICU (newborn intensive care unit), which the March of Dimes will hand-deliver. sharing your baby’s first milestones at #babysfirst with our social community. engaging with us on World Prematurity Day, November 17th to raise awareness and learn about the cutting edge prematurity research that saves babies’ lives. We have set a goal to generate 380,000 actions to save babies’ lives, to symbolize the 380,000 babies born too soon each year in the U.S. That’s 1 in 10 babies born prematurely (before 37 weeks of pregnancy). This rate is higher than most other high-resource nations. Even babies born just a few weeks too soon can face serious health challenges and are at risk for lifelong disabilities including breathing problems, vision loss, cerebral palsy, developmental delays and intellectual disabilities. The problem of prematurity involves babies being born too soon and often with birth defects and complications that affect them for life — that’s if they make it through the first critical days and weeks. There are so many challenges for these babies and their families from day one that tomorrow is a dream. Give them tomorrow is supported by our corporate partners who are committed to saving babies’ lives. Partners in 2016 include Mud Pie, Philips Avent, Famous Footwear, ALEX AND ANI, ALDI, Bon-Ton, and Anthem Foundation. Won’t you join us today as we make a difference in the lives of all babies? Together we can give them tomorrow by doing something today. The March of Dimes is the leading nonprofit organization for pregnancy and baby health. 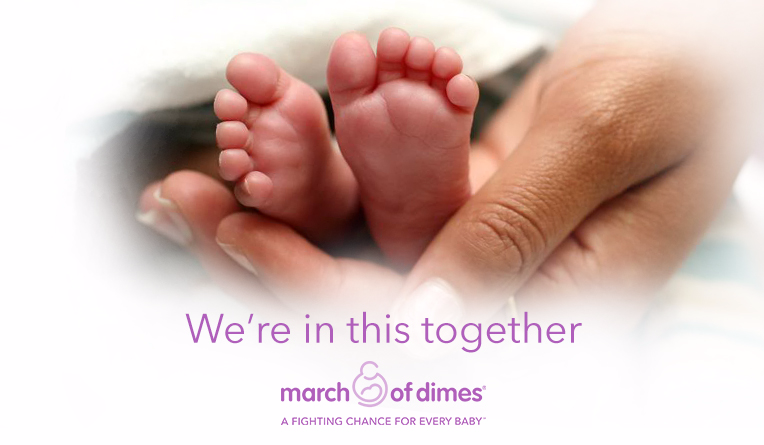 For more than 75 years, moms and babies have benefited from March of Dimes research, education, vaccines, and breakthroughs. For the latest resources and health information, visit marchofdimes.org and nacersano.org. You can also find us on Facebook or follow us on Instagram and Twitter.